You can only apply for Medicare Supplement Insurance when you have enrolled in the Original Medicare, Part A and B. The supplement insurance provides additional payment for the out-of-pocket costs of the Original Medicare. Private companies offer Medicare supplement plans. These plans can cover costs that are not covered by Original Medicare such as copayments, coinsurance, and yearly deductibles. It can also pay for expenses of emergency overseas travel and excess charges of Part B. • It can help pay for costs not covered by the Original Medicare. This can help provide for finances related to healthcare as you retire with your current employment. • As you retire, you might consider traveling abroad. This plan can cover emergency medical care up to 80% of medical costs outside the country. • You will be able to keep your hospitals and physicians who are covered with Original Medicare. Plan coverage is maintained as long as premiums are paid accordingly. The question now is when a person has retired, is he/she qualified for Medicare? Medicare eligibility is not based on your employment status. Its bases include age, the presence of disabilities and other health conditions. When you aged 65, you are eligible to get Medicare as well as supplement insurance. People with disability benefits and end-stage renal diseases are also qualified. If you are enrolled in Original Medicare and has decided to get the supplement insurance, it is best to get one during the six-month Medicare Supplement Period. This period is when you are 65 years old and is enrolled in Part B. During this time, insurance companies will highly offer Medicare Supplement plan, and might not charge you with higher premiums. Retirement needs efficient planning to make it as smooth as possible. As a person ages, he/she needs to take actions to maintain his/her health. 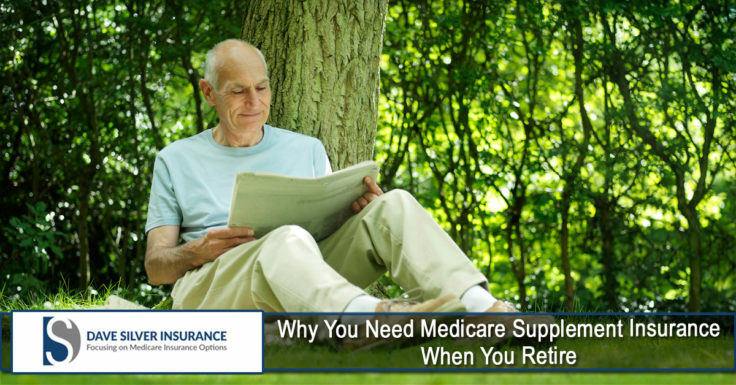 Medicare Supplement Insurance can help you as you or a significant other go along in this stage of life. At Dave Silver Insurance, we work hard in making sure that our clients are well-protected with policies that they can afford. To learn more about how we can help you, please contact our agency at (941) 907-2879 or Click Here to request a free quote.